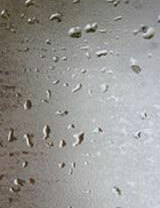 Condensation occurs where humid air comes into contact with air, or a surface, which is at a lower temperature. Air contains water vapor. The warmer the air, the greater its capacity for carrying water vapor. When warm, moist air comes into contact with a cooler surface, or cooler air, it drops in temperature, and loses some of its capacity for storing moisture, so some of it is released to form condensation in the air, as steam, or on the surface as water droplets. We usually observe condensation on surfaces that cannot absorb liquid, for example windows, ceramic tiles, etc, but it can form on any surface, and it may not be noticeable until mold appears, or the material starts to rot. In winter, the moisture content can be increased because of heating, which can also generate moisture, as well as increase the capacity of the air to carry water vapor. Moisture can also be drawn from the fabric of the building itself, where faults have developed because of, for example, a failed or missing damp proof course, or damaged drainage systems. 2.) Provide good ventilation, to increase the circulation of air. After a bath or shower, open a window to the outside, and close the bathroom door. Where possible, dry washing outside, where not possible, ensure a window is open to provide ventilation to the outside. Add powered ventilation/extraction to areas which generate high levels of moisture e.g. kitchen, bathroom etc. It is highly unlikely that a house will ever become condensation-free, but by ensuring the building is maintained in good condition and by adopting relatively minor changes to lifestyle, condensation can be reduced.